THE SECOND TABLET OF THE MEETING OF GILGAMISH AND ENKIDU. 5.Shewing [her beauty (? )], the place of his birth he 3 forgetteth. Caught he. (So) he, having mastered the lions, the shepherds slept soundly 2. (About thirteen lines are missing, a gap in which a sinister figure has evidently appeared, sent evidently by Gilgamish to learn the meaning of the arrival of the strangers in Erech. Enkidu sees him and speaks). 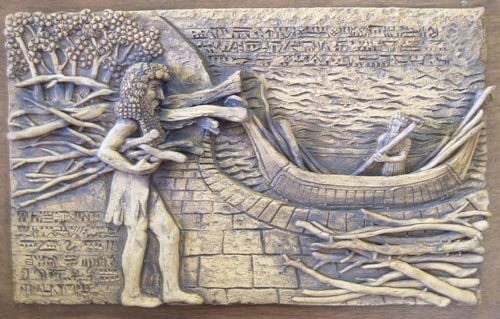 (The Entry of Enkidu into Erech). 16:7 Read i-na [be]-ri-shu [ip]-hu-ru ri-ia-u. 17:2 Use of rabutum “greatness.” It has no meaning if it is applied as an epithet to the shepherds. 17:3 The common meeting place of the men of the town, as sometimes in Arab villages to this day. 18:1 I have used a euphemism here. From l. 1 to l. 29 the text is very difficult. 18:2 Lit. “for Ishhara,” the goddess of love. 19:3 The mother of Gilgamish.